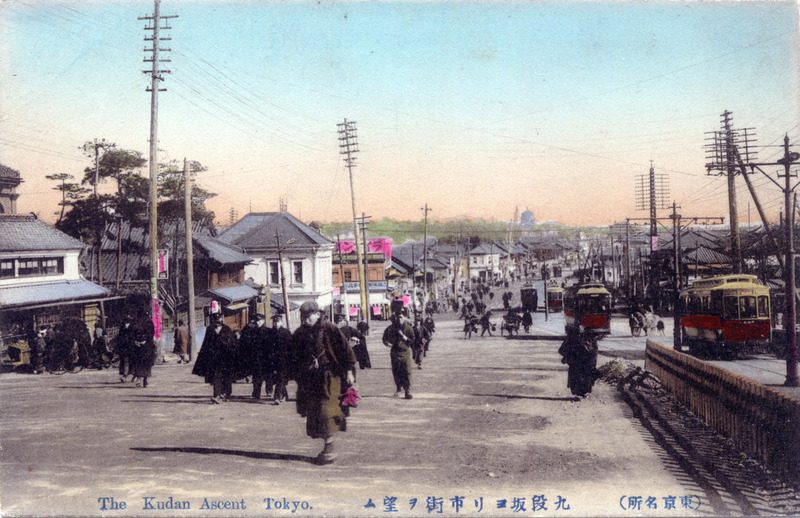 Kundanzaka (Kudan Slope), Tokyo, c. 1910. 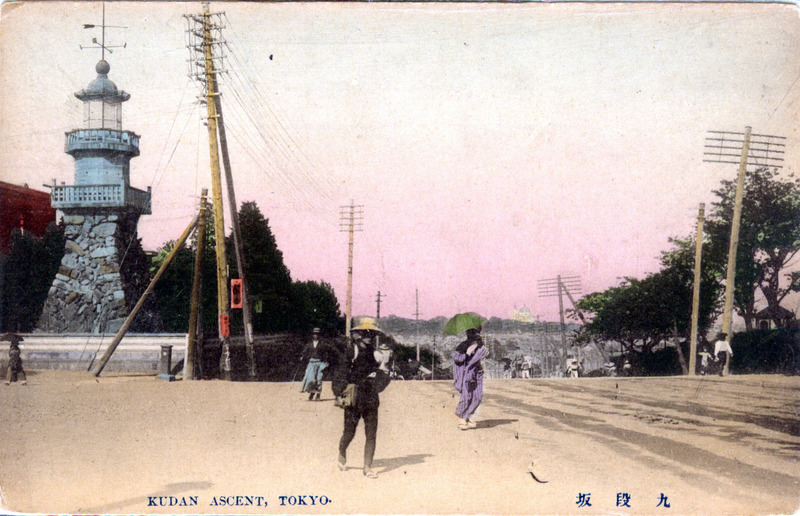 Kudan Ascent, Tokyo, c. 1910. Looking east from the summit toward Ochanomizu. At left is the tomyodai (lighthouse) built in 1871. In the distance, faintly right of center, can be seen the dome of the Nikolai Russian Orthodox Cathedral at Ochanomizu. “Kudan Hill, with its famous shrine and museum, stands at the northwest corner of the Palace grounds, in Kojimachi-ku, and is one of the most interesting as well as elevated spots in the city. Approaching it along the wide, populous, and upward-sloping Kudan-zaka – the Broadway of Kanda Ward – one reaches the crest of the hill at the Tayasu-mon [gate] of the Palace, where the barracks (the noon gun is fired here) of the Imperial bodyguard is located. 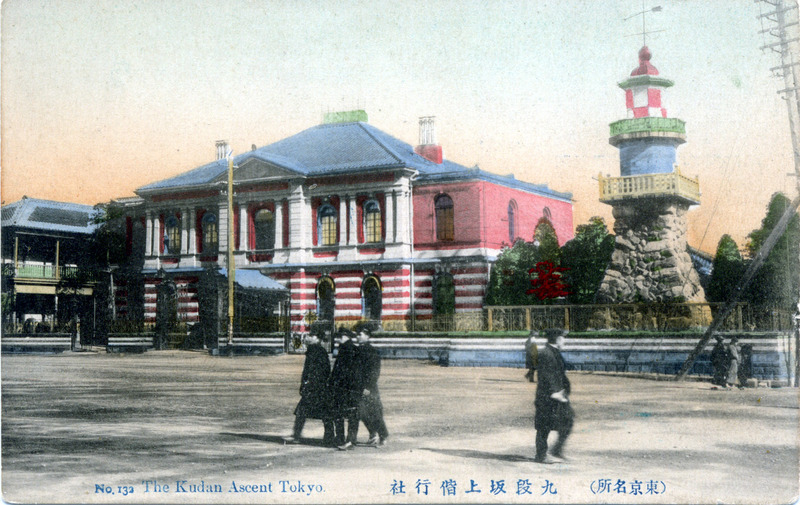 The tomyodai (lighthouse) and, at left, the Kaikosha (officer’s club) at Kudanzaka, c. 1910. From JapanThis! : “In the Edo Period, there was a big hill that led up from Iidamachi. Keeping in mind the Yamanote [mountain hand] vs. Shitamachi [low city] geographical dynamic of Tokyo, Iidamchi was a shitamachi town for commoners; the top of the hill was a yamanote area for samurai. Originally, the hill’s name was Iidamachi Nakazaka. The shōgunate built a residence for officials who were working in nearby Edo Castle. The pitch of the hill was so steep that it had to be reinforced with stone walls and nine steps of stairs and the hill came to be called ‘Kudanzaka’, the Nine-Levels Hill. I get impatient, not knowing my way around. To come and see you, my song, at Kudanzaka. That enrolls my son among the gods. Your unworthy mother weeps for joy. Looking east from the summit of Kudanzaka. In the distance can be seen Nikolai Cathedral, c. 1910. A streetcar ascends Kudan Hill. 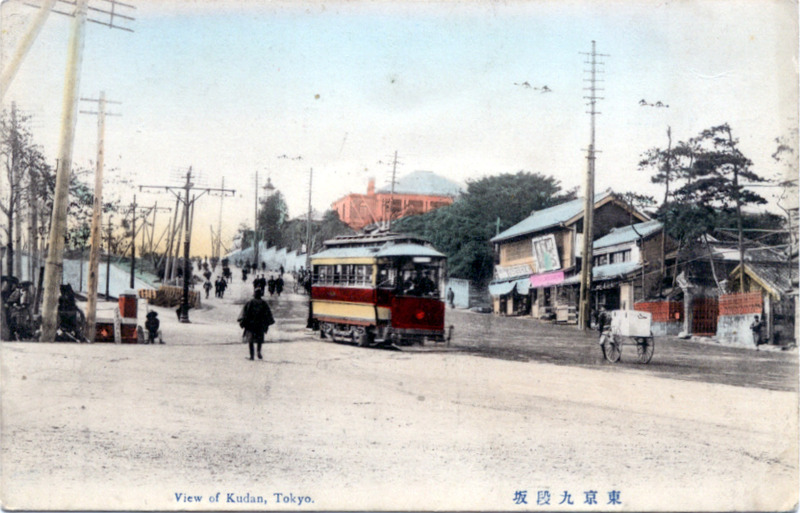 At center can be seen the Kaikosha and lighthouse atop Kudanzaka, c. 1910. 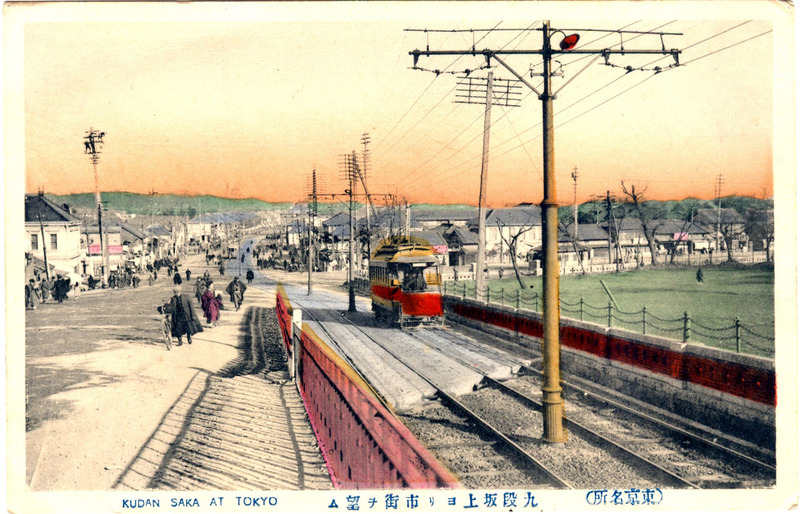 Streetcar ascending Kudan Hill, c. 1910. 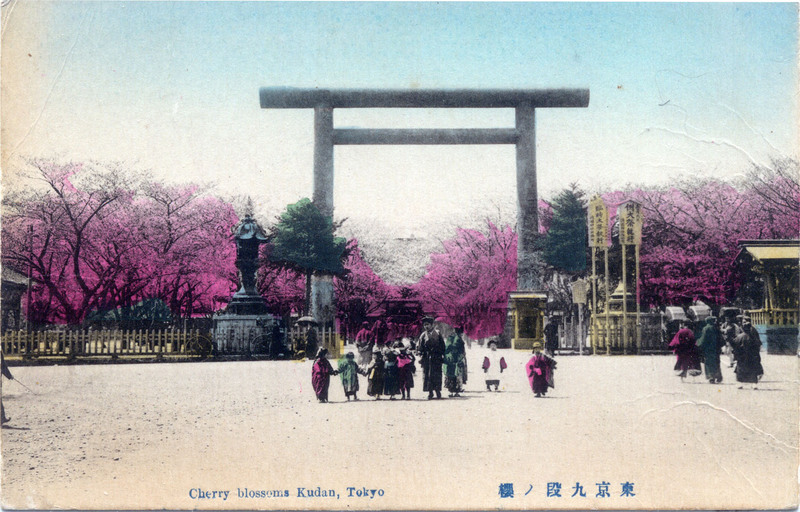 The torii entrance to Yasukuni Shrine at Kudanzaka, c. 1910.